I have a story to relate to you, and humbly submitted, it’s quite compelling. It centers on the days and the weeks I spent in the bowels of Lower Manhattan, in and around the pile of sacred rubble at Ground Zero, and on the specific whirlwind of harrowing moments I experienced in the immediate hours following al-Qa`ida’s terrorist attacks on the World Trade Center on September 11, 2001. It is a tale of a deeply divided nation briefly stumbling upon a cause for unification. It’s a period of time that I’ve long pined to return to. But just what will it take to foster a similar type of national unity again during these most neo-polarized of times? I shudder to think about one seemingly certain possible catalyst…another 9/11. This story will take a bit to fully relate to you, so please settle in. I promise it’ll be worth the read…and the ride. Less than two weeks after one of the most divisive and contentious presidential elections in modern history, Donald Trump’s improbable victory, and the caustic hysteria that ensued, both became seminal events in American political history. A Gallup poll released on November 21, 2017 succinctly encapsulated the deranged fever pitch that easily overtook and subsequently obliterated any sincere efforts to engage in polite and civil discourse. Over three-quarters of us? Wait…What? Yes, over three-quarters of America, some three out of four folks polled, feel that we are a divided country. Hell, one cursory glance at the news easily spells that out for even the most reclusive and hard to reach of the low-information populace. And it begs the question: How did we get from there to here? If, in the immortal words of Dr. Martin Luther King, Jr., the arc of the moral universe is long but bends towards justice, does it also stand to reason that time’s inexorable march inevitably impacts a Union that survived a civil war, but which is fraught with fissures, fractures, and a deep divide that bends toward dissolution? Haven’t both the State of Texas and the deeply disappointed People’s Republic of California recently expressed interest in secession? Makes one long for those long diminished feelings of patriotism, shared sacrifice, and unity so prevalent during the national war effort of the early 1940’s, and most recently reincarnated on September 11th, 2001. The horrors of that day so implacable in their vivid replaying in the mind’s eye of those who experienced it up close or through the shrinking world of live television reports and videotaped treatments of those horrific and mind-numbingly shocking images. They were almost so surreal as to be considered a celluloid treatment from some Hollywood studio bent on shocking the senses and suspending disbelief. 9/11 changed the way we saw ourselves as Americans… for a little while. pile. empathize with their mourning and loss. And I will never be the same after surviving that day. I do sense that America has forgotten those unique ties that bound us together that morning. E pluribus unum: Out of many, one. Our country’s sacrosanct motto. 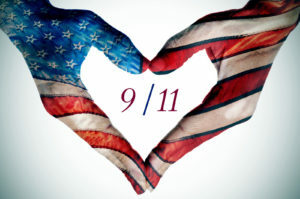 But, absent another unthinkable tragedy of this magnitude, America may never again realize the common ground we found that tragic day; a day we sought to bridge that ever-widening gap of race, religion, politics, ideologies, and culture. AMERICA, once an idyllic melting pot, an example to the world, has devolved into various groupings of like-minded folks with parochial interests and a shared self-serving worldview. We are a wholly fractured nation. The differences that once made us — as Aristotle saw it — a whole that is greater than the sum of its parts — have now simply become the rallying cries of “Vote your interests” and “Don’t let them get away with this.” We prize diversity in all things in 21st century America…except thought. Yes, yes, indeed, we ARE a fractured thinking nation. But it sure didn’t feel that way as the sun began to set on that cloudless blue sky in the evening on September 11th, 2001. And as my two parents had often spoken in poignant detail of where they were and what they were doing that late November day in 1963 when the 35th president was assassinated in Dallas, I, too, have that never-forget recollection of 9/11; that tragic day of heartbreak and anger that led to the brief and fleeting unification of America. Here are my memories of the harrowing imagery that collectively saddened us and angered us, and through our grief and calls for retribution led to a fairly BRIEF national flirtation with oneness. It was December of 2000. And while a then member of the FBI’s elite Hostage Rescue Team (HRT), I had deployed to some of the most dangerous places on the face of the planet. Assigned as a counterterrorist operator, an assault team member, I had spent much of the past four years away from home. The pace of deployments was relentless. I missed my kids terribly. They resided with their mother in upstate New York, and I had recently come under orders to return to my first FBI division, the flagship, the storied New York Office situated in Lower Manhattan. I could again be stationed closer to my children. There was to be a coveted position awaiting me on a criminal squad, C-11, a freewheeling narcotics task force that joined seasoned NYPD detectives with a motley crew of talented FBI special agents “narcs” in order to target the cartels and drug organizations plaguing New York City, mostly by way of parts of Brooklyn or Washington Heights. I was beyond excited. It was an opportunity to return to investigative street work that I had sorely missed while away for four years, serving on the FBI’s HRT. But there was to be one final mission before my return to the Big Apple. 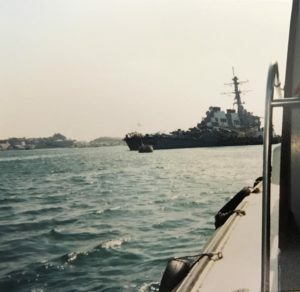 The operation to brazenly attack an American warship in Yemen’s warm territorial waters in the port city of Aden had been a resounding success for al-Qa`ida in December of 2000. The U.S. warship was crippled, listing dangerously to one side, and in imminent danger of sinking. Seventeen courageous U.S. Navy seamen were left dead in the blast that tore a 40’ x 60’ gash in the ship’s port side. Less than three full days after the attack, I stood on the wounded warship’s deck, my M-4 carbine at the ready, eyes steadily scanning the horizon, sweating profusely through my issued body armor, salty rivulets pouring off my shaved head from underneath my desert brown ball cap with subdued HRT “Eagle and Broken Chain” embroidered logo. The body armor itself was suffocating. And I had “doubled up” on it. Supplementing the Level 3-A Kevlar vest, replete with front and rear “shock plates,” I’d also elected to squeeze two square steel plates that were connected together by nylon strapping material and had the capability to, at least slow down rounds from an automatic weapon. The human body can never really be TOO up-armored. And this assignment required precious little movement, so the insufferable weight, in the stifling heat, wasn’t a factor for consideration. So I paced the Cole’s deck topside, and I watched the sweat puddle up beneath me. Every breath was torturous, as there was no relief from the stench of diesel fuel and explosives residue. The air was acrid from the hanging smoke that still enveloped parts of the crippled warship. I had already been inside “the hole.” I had toured the impact area, down within the bowels of the vessel, observing the place where the terrorists’ bomb had vaporized them in the instant that the ship’s side was pierced. I took in the rent metal within the gaping hole, imagining how the blast must have riddled the unsuspecting U.S. servicemen with deadly shrapnel; callously murdered while they casually dined and made small talk in what once served as the Cole’s galley.